Plaster is a building material used for covering rough surfaces of walls, columns, ceilings and other building component with thin coat of plastic mortars to form a smooth durable Surface. The coating of plastic material (i.e. mortar) is termed as plaster. This process is known as plastering. Plastering on outside open surface is also known as rendering. Mortar is lean mix of Binding Materials (Lime or Cement ) with fillers such as sand or crushed stones. For good plaster, it is necessary that the plaster should have proper bond with the surface of masonry. Plaster is manufactured as a dry powder and is mixed with water to make the hard but efficient paste before it is applied to the surface. A form of plastering was used by the ancient civilizations, creating durable and weather resistant structures using mud. Plaster provides a smooth, regular, clean and durable finished surface with improved appearance. 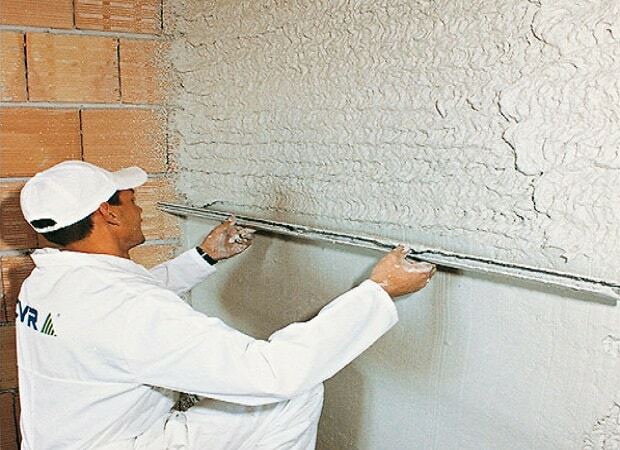 People use plaster to cover the bare stone or brick on the walls of houses, both inside and outside. Plaster can cover unsound & porous material. Plaster protects the surface from atmospheric influences. Plaster increases the strength of wall. Plasters have ability to increases the durability /life of wall. It can prevent the penetration of water from one side to other. Plaster provides a suitable plain surface for color wash/paints. Plaster provides fire prevention up to certain extent. 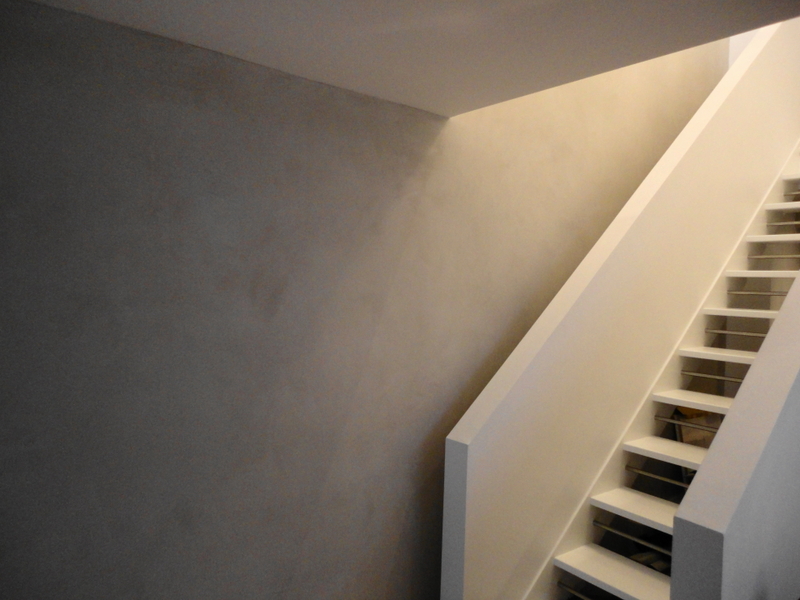 6 mm to 12 mm thick plaster used on internal plaster, completed in one coat. 6 mm thick plaster is used for ceiling plaster to RCC slab. For wall plaster 6mm to 12 mm thick plaster is used. 18mm-20mm thick plaster is used as external either rough or smooth-faced, and done in two layers. The different types of plaster can be classified on the basis of ingredients used and the proportion of building materials. Cement Plaster is also the type of plaster which is mixture of sand, Portland cement and water. It is particularly suitable for moist conditions. 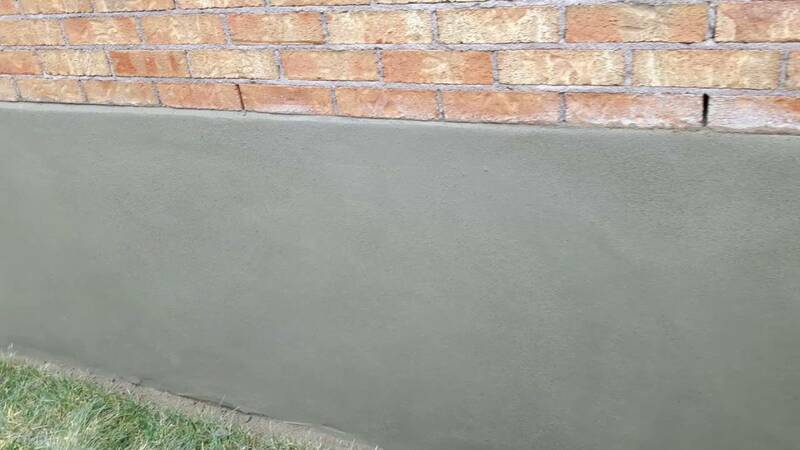 Cement plaster is normally applied in one coat, which is usually applied to achieve smooth surfaces on the internal and external surface of masonry. Various cement-based plasters are also used as proprietary spray fire proofing products. In Gypsum Plaster, gypsum is used as a binding material instead of Portland cement. It is available in ready to use format and does not need sand. It is used only on internal walls and ceilings. Again it cannot be used in wet areas like a toilet, bath, kitchen, wash area, etc. Gypsum plaster does not require curing which saves up on all that water. It can be applied on both smooth and rough surfaces. Clay plaster is a mixture of clay and sand that makes a beautiful, durable Surface. Clay plaster is made up from cheap and non-toxic ingredients. Clay has the natural ability to control moisture and heat from the surrounding air. Materials can often be found on local building site. The techniques for mixing and applying are very simple and plaster is very indulgent, even for beginners. Clay plasters are only suitable for interior surfaces. This mud plaster is prepared from equal volumes of well tempered clay or brick earth and chopped straw, loose soil or hemp and cow dung. All these ingredients are thoroughly mixed and left for about 7 days with a large quantity of water. This is mixed again thoroughly till it comes to the desired consistency of mortar. Mud plaster is bar oldest and very cheap. Usually mud plaster is done in construction on a large scale in rural areas for low cost housing. This type of plaster is still done on large scale. Mud walls usually do not have any foundation. Stucco or Render is a material made up of aggregates, binder and water. Stucco is applied wet and it hardens to a very dense solid. It is used as a decorative coating for walls and ceilings, and is used as an artistic material in the architecture. Stucco may be used to cover less visually attractive construction materials, such as metal, concrete, cinder block, or clay brick and adobe brick. In stucco colored aggregate are used which gives it a beautiful look. The binders are generally chemical & the thickness of the layer is very less. In this finish, smooth, leveled surface is obtained. The mortar for the finish may be made of cement and fine sand. Mortar is applied with the help of wooden float. Steel floats are not recommended for external renderings since they give a very smooth finish which is liable to cracking and crazing under exposure to atmospheric condition. Generally this kind of plaster is used to coat the internal walls. This plaster is a mixture of sand and gravel, which is covered on freshly plastered surfaces. Roughcast plaster finish is also known as “Spartan Dash Finish”. Mortar used to get rough cast finish consist coarse aggregate along with cement and sand. A large quantity of mortar is taken by trowel and it is dashed into the surface and leveled by using wooden float. Generally, this type of plaster finish is preferred for external renderings. Sand faced plaster is a layer of cement-sand mortar applied on brickwork and also serves as a damp-proof coat over the masonry. This type of plaster is used to give a finishing touch to a surface on walls and ceilings. To some extent, they also serve as a sound and thermal insulation material. 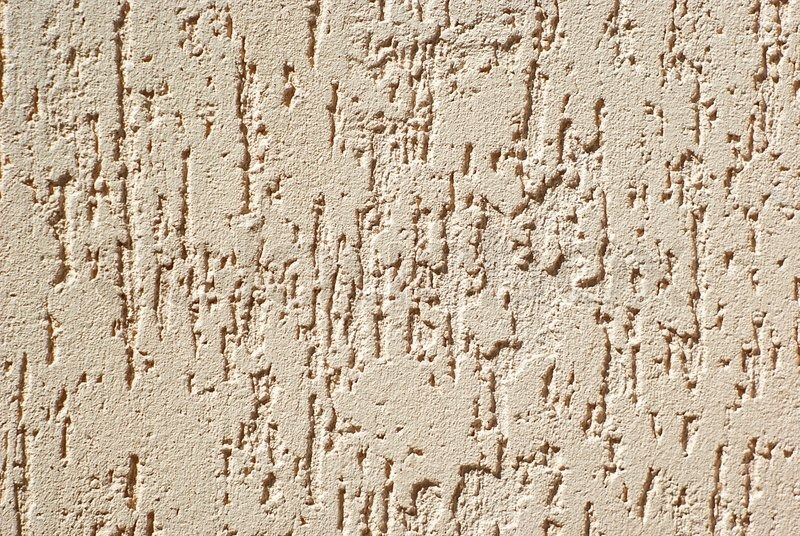 Sand faced plaster is also used as a decorative touch to the buildings and provides a sustainable base for paint colors. A sponge is used on the second coat when the second coat is wet. It works like a sand grain and makes the surface equal and uniform. Thus in this plaster, artificial micro cracks are provided to reduce the cracks. Scrapped plaster is a finish in final coat. After being leveled, it is allowed to stiffen for a few hours. When it has set, it is scraped with a steel straight edge or saw blade to remove some 2 mm from the surface to produce a coarse textured finish. Various types of scrapped finished can be obtained by using different types of tools. Textured finish is obtained from the stucco plastering. Textured plaster finish can be created with different tools on the final coat. This type of finish possesses all the advantages of rough cast finish. Pebble dash plaster is similar to roughcast plaster. It is a finish in which small pebbles or crushed stones of suitable size (usually varying from 6 to 20 mm) are used after first coat of plastering, Pebbles aggregate are dashed on to the coated surface, and press on them by using wooden float into the plastered surface slowly. After pressing cement slurry is cleared to give a look of only stones. Many times groves or pattern are created to give a better look. After hardening, they provide an aesthetic look to the structure. Instant Neeru (Sanala) is easily available in the market. Prepare a paste of the Neeru (Sanala) by adding water, two hours before its application on a fresh plastered surface. Instant Neeru (Sanala) is very convenient and easy to use. Small quantity of cement can be added to Neeru (Sanala), to improve its bonding with plaster. Quality of Neeru (Sanala) should be checked before applying it to the plastered surface. Mortar for Neeru (Sanala) finish shall consist of 1 part lime putty and 1 part fine sand. The mixture shall be properly ground to a fine paste between two stones. The surface of the undercoat on which the Neeru finish is to be done shall be left rough. Sand faced plaster is a layer of cement-sand mortar applied over brickwork and it also serves as a damp-proof coat over the masonry. This type of plaster is used to give a finishing touch to a surface. A sponge is used on the second coat when the second coat is wet. It works like a sand grain and makes the surface equal and uniform. In this plaster, artificial micro cracks are provided to reduce the cracks. Mala plaster is not a technical word and it is not described anywhere in any Code or any textbook. It is a word derived from local practice and tradition. Hence there is all possibility that every different location people defend it differently. However, it is a single coat plaster without any smooth finish. It has a rough finish but again not that much rough and textured like double coat sand face plaster. It is not used as a final finish, and it is used as a sub coat only. It mostly used for the surface where either POP putty or other putty is to be applied as a sub-base of painting as this putty needs a rough surface. It is left rough for providing a bond. Generally, thickness varies from 20 to 50 mm, and the proportion is as adopted for normal and internal plaster. 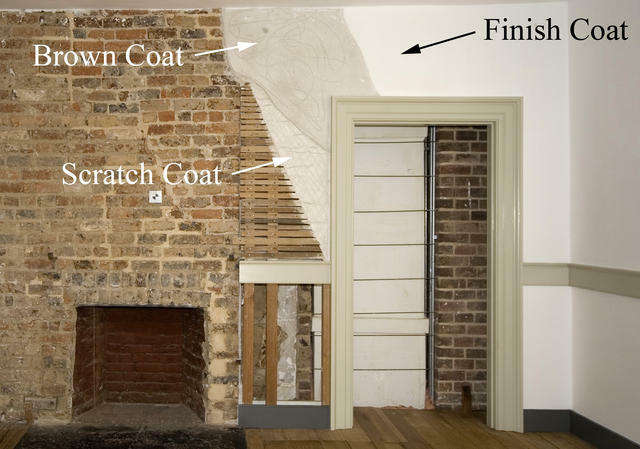 Three coat plaster system starts with two coats or rough coats. These coats form a wall and mix of lime or gypsum, aggregate, fiber and water. The sand used in the rough-coat plaster is the most common. This is known as finish coat plaster. Cement mortar ratio 1: 1 indicates that there is one part of cement/ lime and one part of sand. This is very rich mortar mix. Cement mortar ratio 1: 2 indicates that there is one part of cement/ lime and two part of sand. This is also very rich mortar mix. Cement mortar ratio 1: 3 indicates that there is one part of cement/ lime and three part of sand. This is also very rich mortar mix. This mortar mix is not used in general applications. It can be used as a repair mortar. Cement mortar ratio 1: 4 indicates that there is one part of cement/ lime and four part of sand. In Plasterwork Generally 1: 4 used for external plaster and ceiling plaster, where plaster is 10- 12 mm thick. Cement mortar ratio 1: 5 indicates that there is one part of cement/ lime and five part of sand. These are used in both internal and external plaster. Thickness of internal plaster can be 12 mm and external plaster thickness can be 15mm to 18 mm. Cement mortar ratio 1: 6 indicates that there is one part of cement/ lime and six part of sand. This ratio can be maintained for external plaster. A thickness of external plaster can be 12 mm to 15 mm. The above are all volumetric proportions. In Western or European country, plaster is getting outdated as it is labour intensive wet process. Which is also time consuming and its look ultimately depends on the skill of Mason. However, in India an Asian countries, it is most widely used a popular, as it is the cheapest and best material to protect and decorate bricks or stone works.